A Mercury globe with 3d surface relief detail. Mercury, is the closest planet to the sun. A terrestrial planet 4,879km in diameter, it is smaller than the moon Ganymede, yet has twice the gravity and almost three times the density. This globe has been made using data from the MESSENGER mission, featuring both colour and anaglyph relief detail. The relief detail itself is highly accurate on the northern hemisphere which has been mapped by the probe's MLA instrument, while detail for the south hemisphere has been filled in using USGS data derived from stereo image shadow analysis / photoclinometry techniques. Elevation has been somewhat exaggerated on the z-axis to make for a more tactile object. To scale, with it's highest point at 4.4km and lowest at 5.3km this would translate to only about 0.2mm variation on the surface of the 200mm globe. 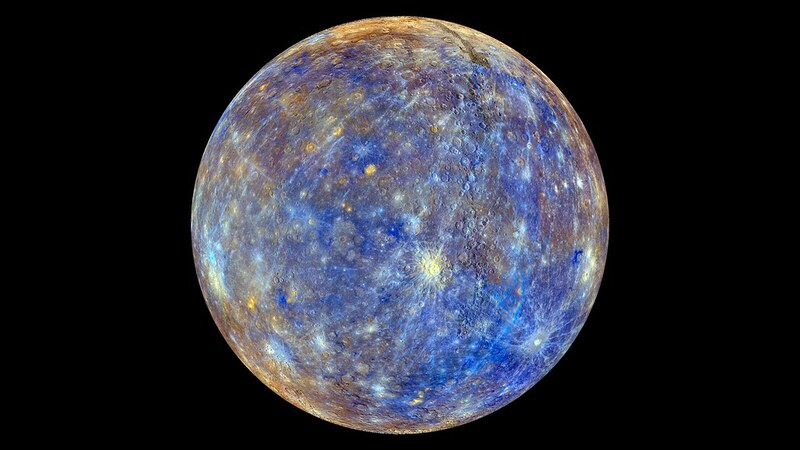 Note: It is possible to create this globe using the enhanced colours global map of Mercury produced by the MESSENGER team, or with a false colour "rainbow" elevation map, but a physical printout of these objects has yet to be made. Nevertheless if you'd be interested in one feel free to get in contact.